Retail audit software has revolutionized the way retail audits are performed. Instead of having to deal with mounds of data to be input and analyzed, now retail operations can easily access and interpret the information coming from points-of-sale, with little concern over issues such as clerical errors and fraudulent check-ins. Most retail audit software solutions on the market charge on a cost/user/month basis, but some charge an additional cost/location that can snowball and easily blow up any project budget. Ideally, a retail audit software should be scalable and able to adjust to retail operations big and small, with equal level of service and reliability. One of the most frustrating things is business is having to rely on IT departments or outside contractors in order to deal with mission-critical devices and applications. Choosing a retail audit software solution that requires no specific hardware, installations, downloads, deployment, etc, will make the implementation process a lot simpler. Cloud-hosting is the ideal situation for retail audit software solutions, since it is paramount for it to be operational and accessible 24/7. 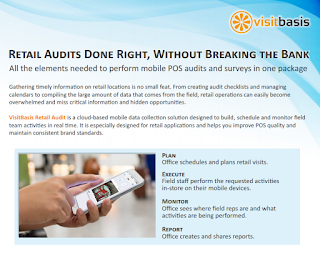 VisitBasis is a comprehensive retail audit software solution for businesses of all sizes. VisitBasis allows creating task templates for everything that needs to be checked at the retail location, providing a budget-friendly and easy-to-use system that helps you take full control of retail audits at the point-of-sale. Ready to try the benefits of mobile? Sign up today at www.visitbasis.com for a free trial, or book a free online demo to see how it works.